Looking for an album of thoughtful worship? The Paths of Grace CD builds strongly on from Stuart Townend's previous album, The Journey, with a new collection of Christian songs and lyrical hymns for the Church today. As you'd expect from this sensitive and creative song writer, this is a collection of expressive and devotional music that is not just for the Church but for every church member to hear, listen to, share, sing and make a response. Unmistakably Stuart Townend this blend of folk sounds and rhythms, with its Celtic lilt and rich lyrical heritage, also has much to say about and to the Christian in their daily life in today's home, workplace and public arena. There's a song about unity, about meeting Christ in the streets rather than just in church. There's, a setting of the Lord's prayer, and a deeply thoughtful song that stands like a scaffolding for prayer when you need it most. These songs of grace and strength are equally effective sung aloud in congregational worship and hummed or simply heard in times of private devotion. But there are also songs to 'get you out there' into the real world; where the Gospel message is most needed and least known. Diary of an Agnostic is more for the evangelistic in tone as is Streets of the City; just a bit edgy and keeping you thinking about what you're actually singing. This is an album with a strong acoustic folk flavour, especially with the voice of Ruth Notman, but with attitude. There's a bit more big drum and a bit more electric guitar but definitely still within the abilities of your local worship band when the sheet music comes along. This is the Stuart Townend album for all seasons and all spaces. You'll want it with you in your quiet times, when you're out in the world and when you're building your faith in the company of othe Christians. It's the collection you've been looking for to bring you close to God and give you the motivation to take God with you into a world that needs reminding of Gospel message more than ever before. The Paths of Grace CD by Stuart Townend was published by Integrity in May 2014 and is our 2967th best seller. The ISBN for The Paths of Grace CD is 0000768619728. Some marvellous tracks on this CD. Singing Hallelujah is so overwhelming. That said, as with all of his music, everyone will have their own preferences. Got a question? No problem! Just click here to ask us about The Paths of Grace CD. 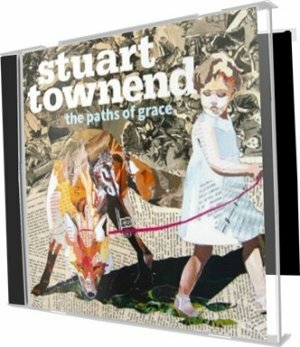 The Paths of Grace CD is a new studio release from modern day hymn writer, Stuart Townend. The sound is folk and the lyrics tell a story - underpinned with biblical truth and social commentary. In life we are lead along ever changing paths. Paths of grace, confusion and trials. This brand new 11 track album celebrates justice and freedom, portraying predator and prey living together in harmony, a biblical symbol of the future to come - an image of a world where reconciliation is established. "The title track, Paths of Grace, looks critically at the journey of faith and takes you down an unexpected lyrical road. 'Good shepherd of my soul' has a very Celtic edge with a typically Townend folk backing. Maybe the most memorable track, 'O church of Christ invisible' is the strongest song on the album with the classic Townend blend of lyrical richness and melodic lift in the Charles Wesley singable theology tradition." The Paths of Grace presents you with probably the most original and meaningful album cover ever to grace a Stuart Townsend CD. The album cover art is strikingly contemporary. It might be no coincidence that all the finalists for the 2014 Turner prize; representing the cutting edge of British artistic talent are also, in one way or another, collage creations. But with its newsprint collage image of a child leading a rather fierce looking fox it is also strangely old-fashioned; with the little girl dressed in a simple white dress and white sandals reminiscent of a nineteen fifties advertisement. The album, which features eleven brand new worship songs with themes of faith, community, prayer and daily devotion presents its gospel rooted message through beautiful acoustic arrangements that will inspire individuals and congregations to worship. The themes of Paths of Grace are drawn from Isaiah 11. The most famous and most quoted verse from this chapter is: “The wolf also shall dwell with the lamb, and the leopard shall lie down with the kid; and the calf and the young lion and the fatling together; and a little child shall lead them.” To quote the King James Version. This word image has become something that’s taken far more literally than the speaker intended. Many Christians read into this the interpretation that the ‘little child’ is Christ. This depends on what you think the Old Testament prophet knew of God’s future plans. Certainly, Isaiah was mainly concerned with the kind of world that would be established under the God’s kingdom of justice and reconciliation. He looked to a world where predatory people and practices are tamed and they live in harmony with the vulnerable and victimised; a world so in tune with itself that it needs only the innocence of child to lead it. The fulfilment of this prophecy is long way from coming, it seems. In the meantime, the call is still for God’s people to bring that kingdom in by whatever small way and in whatever small place they have influence. Christians look to Christ to lead the way along his paths of grace, through the confusion and trials of life toward this place of justice, innocence and reconciliation. I don’t know for certain, but if you look closely, might it be that the fox collage is made up of bits of tabloid newsprint, the child created from pages from the Bible? Now Playing: Promise of the Ages Your browser does not support the audio element.